Leverage your existing GPIO contact closures or logic levels into A/C power control with Dataprobe iBoot-IO-LS (SKU 1410044). 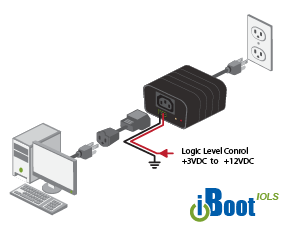 A single outlet power switch with I/O control, iBoot-IO allows you to easily integrate remote power control into your existing management system and manage devices remotely. iBoot-IO is perfect for remote reboot, test automation, environmental control, security access or any remote or automated facilities. Four models are available to cover any I/O Controlled power application. Select between default power ON typically for remote reboot applications or default power OFF to reverse the logic of the inputs. Models are also available for either wet or dry control inputs. Wet (Logic Level) inputs trigger on +3 to +12 VDC and are suitable for TTL and RS-232 control signals. From closing a gate on a ranch, to causing an alarm to sound, to managing a boiler room from another building, iBoot-IO gives you the flexibility to monitor and respond to physical alert conditions from wherever you are. 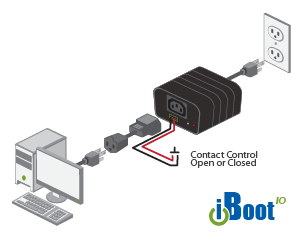 iBoot-IO is easy to install - just attach it to the device you want to control, plug it ino the power outlet and close the control contacts, and you'll gain remote access. The Dataprobe iBoot-IO-LS is also known as Dataprobe 1410044. Answer: Thank you for your inquiry. You are correct about the main image being incorrect. That is an image of the standard iBoot-hub product, not the iBoot-IO-LS. We will attempt top locate the correct picture and upload it for this product.